The ROTATION RATE is the length of time for an object to spin once on its axis. Planetary rotation rates are measured by using telescopes or space probes. Scientists carefully pick a particular feature on the planet (a large crater, a mountain, a spot, etc.). The task is then to determine how long the feature takes to rotate into the same position again. This is the rotation rate. For example, the animated image of our Sun at right has a rotation rate of about 25 days. After a rotation rate is measured, it can be compared with values found for many objects in the solar system (planets, asteroids, natural satellites, and our Sun). An example of planetary rotation that caused astronomers quite a bit of confusion was the planet Mercury. Because Mercury is located so close to our Sun, it was difficult to observe the planet closely. In 1974, NASA sent the Mariner 10 space probe to investigate Mercury. The plan was to have Mariner 10 orbit our Sun in such a way that it passed by planet Mercury three times for every two orbits. 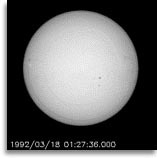 Unfortunately for the astronomers, Mercury has the same rotation around our sun, three times every two orbits, resulting in Mariner 10 photographing the SAME SIDE of Mercury every time! Another planet that is difficult to directly observe rotate is our own planet Earth. This is because we live on Earth and rotate with it. Historically, it was not until after Copernicus that the idea of the Earth's rotation was accepted. Several experiments have been conducted to demonstrate directly the rotation of Earth; one interesting example is the Foucault Pendulum Experiment (ref ). Recently, NASA scientists were finally able to get great movies of Earth rotating when the Galileo probe flew past Earth on its way to Jupiter in 1994. Planet Mars HotList, Jupiter Mission, and Saturn Mission.